1. PREHEAT oven to 350˚ and spray a 13” x18” sheet pan with rolled edges with cooking spray. 2. In a medium bowl, SIFT the dry ingredients together. 3. CREAM sugar and eggs in a large bowl. MIX in carrots until well blended. Alternately ADD the flour mixture and the oil, starting and ending with the flour mixture. MIX in vanilla. 4. POUR into sheet pan and BAKE for 20 minutes or until inserted toothpick comes out clean. 5. REMOVE from oven and let COOL. CUT out 18 round circles with a 3” biscuit cutter. 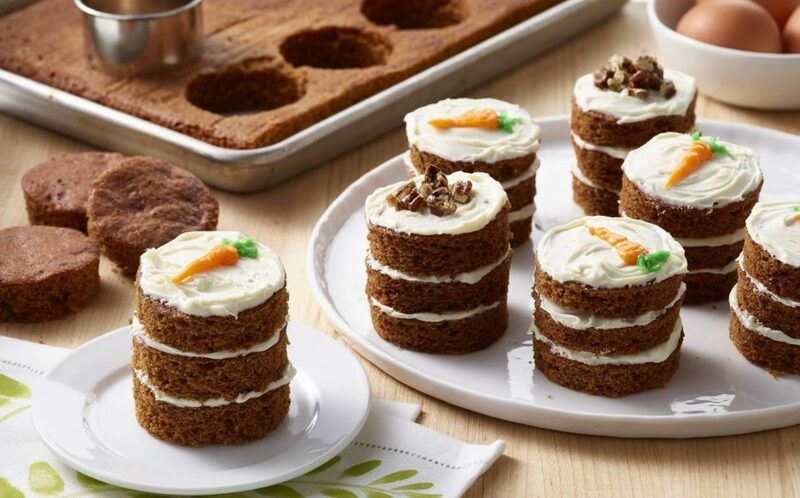 ASSEMBLE 3 cake circles at a time by FROSTING the top of one, then layering a second circle on top of the first and FROSTING the top of the second, repeat some steps for the third. DECORATE tops of mini cakes as desired. 6. BEAT together the butter and cream cheese with an electric mixer. With the mixer on low speed, add the powdered sugar a cup at a time until smooth and creamy. ADD vanilla and mix till blended. • If you prefer the texture of shredded carrots, you can substitute 3 cups in place of the strained baby carrots. • To save time, use pre-made sugar decorations found in the grocery baking section or craft store. Or use chopped pecans. • Desserts with cream cheese frosting should always be refrigerated. This recipe is an excellent source of protein, vitamin A, folate and protein.